We started off with some yakitori and prawn and vegetable tempura. 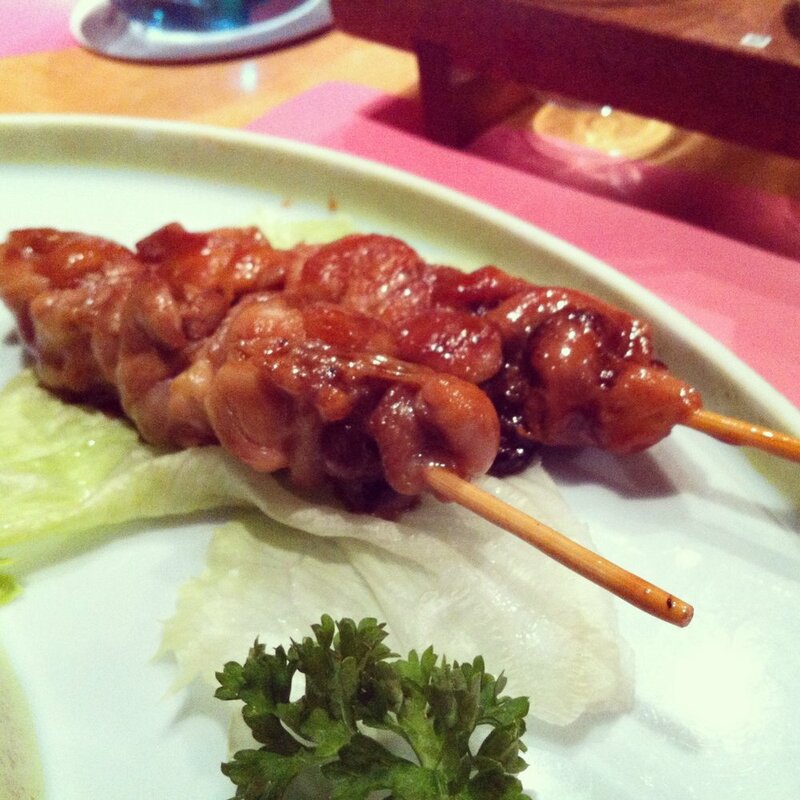 The yakitori was delicious, soft and juicy, but the portion was small - just two skewers. I haven't had bad tempura to date, so this tasted as good as any others I've had, though perhaps it could have done with a little more salt. We had their Sake sample tray with our meal. This was three different types of cold Sake which I found impossible to pronounce or understand when they were being explained to us, so the friendly waiter wrote the names, family, and ingredients down for us to take home! Which brings me to the staff at Matsuri - very polite and pleasant, dressed in traditional attire and more comfortable speaking Japanese than English: they gave the restaurant a lovely authentic feel. Starters done, it was time for mains. And boy, were we spoilt! Not just for choice, but quantity and flavours and the whole teppanyaki experience too. 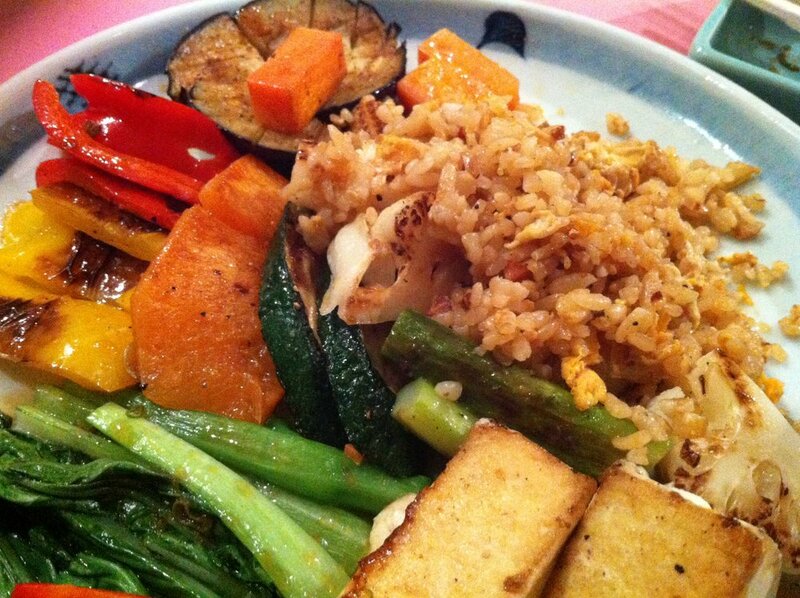 We went for portions of egg fried rice, garlic butter rice, and spicy fried rice, served with vegetables and tofu, and spicy teriyaki chicken. Our chef arrived with his tray of raw ingredients, and sliced and diced, splashed, tossed, drizzled, and sizzled in style. And that was easily the best teppanyaki I have had to date. Dessert was a green tea tiramisu - not really my kind of thing - though it looked very pretty and pleased my aesthetic sensibilities immensely! My husband thought it tasted gorgeous too though. I had the fireball ice-cream - vanilla ice-cream served with pineapple and a sweet pancake, all flambéed right there in front of us. Quite a show! We were the last people to leave Matsuri that night. Many hours of excellent food, drink, service, and entertainment. Highly recommend it!